Artemis Accounts is a fully integrated five ledger multi company, multi currency accounting system that combines the power and sophistication of larger, more expensive, accounting software with a simple menu driven and easy to use design. It is the ideal system for owner and managers of small to medium sized businesses and does not require an accounting background. As your business grows, it can be expanded to multi user mode through the installation of a downloadable Server Pack. The Inventory control functions allow cycle counting, multi level bills of material, and small scale assembly operations. The use of a DUAL BASE CURRENCY design allows the user to maintain accounts in two currencies simultaneously and switch between them at will. The major modules of the system are General or Nominal Ledger, Purchases, Sales Invoicing, Inventory Control, and Bank and Cashbook. Features include . . 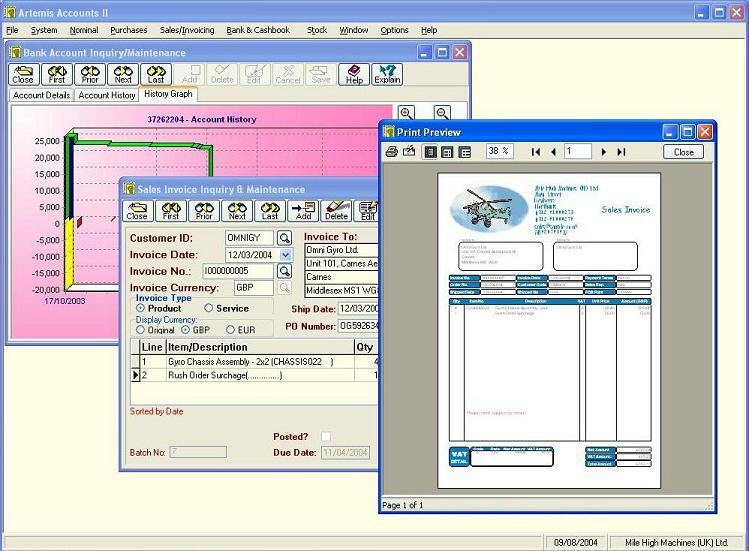 Fully integrated 32 bit Windows accounting system... Multi company and multi currency as standard... Built in Euro capability with one click conversion... Full password security control... No month end or year end routines needed... Continuous open item accounting design... Unlimited history maintained online... Comprehensive lookup function for all codes... Full edit and delete facility on all transactions... Three levels of help built in for all transactions with over 1,200 help topics... Over 150 functions and pre configured reports... Integrated one click backup and restore... Up to 10 VAT or Sales Tax codes with full VAT or Sales Tax analysis and reporting... Asset register with depreciation processing, .. Creates truly professional invoices and statements on plain paper and also accommodates pre printed stationery... Dunning messages for additional invoice customisation... Electronic Invoicing.. Full bank reconciliation. . . . and much more. Note that this product is not suitable for the U.S. market as it does not handle State and Federal taxes.